The barn animals embark on an unexpected journey into space in the first installment of “The Helium Books” series. A space journey takes off in a most hilarious fashion at the farm. 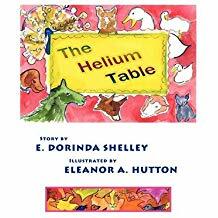 E. Dorinda Shelley presents a space adventure story titled “The Helium Table” (PRGott Books Publishing; 2010). Just likethe other Helium books, this children’s book is illustrated by Eleanor A. Hutton. The space adventure story takes off after Kath and her mother clean off a dining room table, which has been covered for years by junk mail, heavy books, and newspapers. Not knowing it is a helium table that could float away like a balloon, they remove the items from the table. Much to their shock, it floats like a balloon out the front door. The barnyard animals jump onto the helium table to hold it down, but to no avail. The table floats further into the sky, eventually reaching outer space. How will the animals return home with the helium table? Readers will be surprised with how they do it when they order a copy of E. Dorinda Shelley’s “The Helium Table” through Amazon (https://www.amazon.com/gp/product/0984589805) and Barnes & Noble (https://www.barnesandnoble.com/w/the-helium-table-e-dorinda-shelley/1030010409). Watch for the public display of E. Dorinda Shelley’s “The Helium Table,” along with “The Helium Egg” and “Helium Heels,” at the upcoming 2019 London Book Fair New Title Showcase on Mar 12-14, 2019. Dr. Shelley is a retired dermatologist. She grew up in Missouri, spending weekends on a farm with friendly horses. She, her husband, and three children lived for many years on a “farmette” in NW Ohio, surrounded by many of the animals in this story. This is the first in a series of books she has written and Eleanor Hutton has illustrated.